SF State Gators' William Overton Jr. (15) fights for control of the ball from University of San Francisco's Frank Rogers (31) during an exhibition basketball game at Memorial Gymnasium on Saturday, Oct 27, 2012. USF went on to win 93-77. Photo by John Ornelas / Xpress. 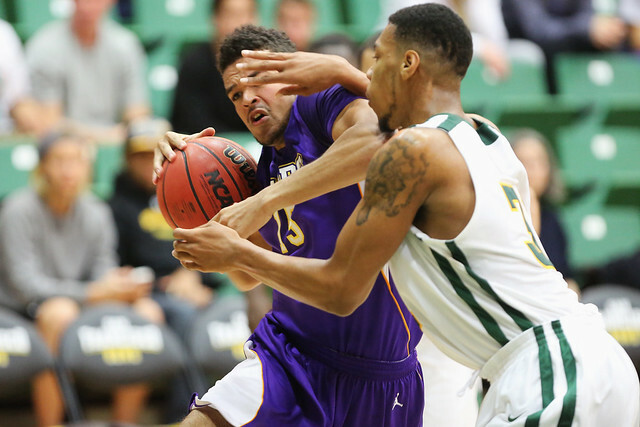 In what was billed as “The Battle for San Francisco,” the USF Dons easily defeated the SF State Gators 93-77 in an exhibition match at War Memorial Gymnasium. The Gators had a large student turnout, as buses organized by the office of Student Life brought SF State fans to the game to increase morale for players and fans who celebrated Gator spirit, according to Dean of Students Joseph Greenwell. While the Gators weren’t as efficient as the Dons Saturday night, they showed flashes of productivity and execution. Their problem was defense, with the Gators not picking up their man on the transition, leading to many open shots the Dons did not miss. The Gators pulled as close as seven points in the first half, but the open shots they allowed let them down. Players like senior guard Nefi Perdomo and sophomore Robbie Herndon put on a good show as Perdomo scored 23 points and Herndon obtained 16. The Gators were pummeled in the first half, but their response out of the locker room showed the team’s resiliency. “Coach (Trevor) told us we’re not playing as hard as we normally play. He has seen us play our best basketball, and we didn’t do that tonight,” Perdomo said. Out of the second half, the Gators were able to put together some runs, including a 14-4 run ignited with a three pointer from senior Decensae White. This brought the Gators to a close 66-56 match in the second half. However, the Gators couldn’t find an answer to Dons’ junior guard Cody Doolin who had nine assists. Doolin penetrated the Gator defense and dropped off passes to his teammates. The Dons quickly managed to exploit SF State’s defense, going on a lightning quick 8-0 run with 9:30 left in the half, with junior forward Cole Dickerson and junior guard De’End Parker scoring 14 and 12 points respectively in the second half. Despite late surges from the Gators led by Herndon, who had 11 second-half points, the Dons were too strong and won the battle.